The Punch and Judy show has roots in the 16th-century Italian commedia dell'arte. The figure of Punch is derived from the Neapolitan stock character of Pulcinella, which was anglicized to Punchinello. He is a manifestation of the Lord of Misrule and Trickster figures of deep-rooted mythologies. Punch's wife was originally called "Joan." The figure who later became Mr. Punch made his first recorded appearance in England on 9 May 1662, which is traditionally reckoned as Punch's UK birthday. 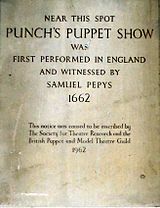 The diarist Samuel Pepys observed a marionette show featuring an early version of the Punch character in Covent Garden in London. It was performed by Italian puppet showman Pietro Gimonde, a.k.a. "Signor Bologna." Pepys described the event in his diary as "an Italian puppet play, that is within the rails there, which is very pretty." In the British Punch and Judy show, Punch wears a brightly coloured jester's motley and sugarloaf hat with a tassel. He is a hunchback whose hooked nose almost meets his curved, jutting chin. He carries a stick (called a slapstick) as large as himself, which he freely uses upon most of the other characters in the show. He speaks in a distinctive squawking voice, produced by a contrivance known as a swazzle or swatchel which the professor holds in his mouth, transmitting his gleeful cackle. This gives Punch a vocal quality as though he were speaking through a kazoo. 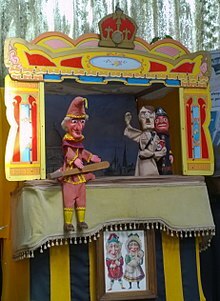 So important is Punch's signature sound that it is a matter of some controversy within Punch and Judy circles as to whether a "non-swazzled" show can be considered a true Punch and Judy Show. Other characters do not use the swazzle, so the Punchman has to switch back and forth while still holding the device in his mouth. In the early 18th century, the marionette theatre starring Punch was at its height, with showman Martin Powell attracting sizable crowds at both his Punch's Theatre at Covent Garden and earlier in provincial Bath, Somerset. Powell has been credited with being "largely responsible for the form taken by the drama of Punch and Judy". In 1721, a puppet theatre opened in Dublin that ran for decades. The cross-dressing actress Charlotte Charke ran the successful but short-lived Punch's Theatre in the Old Tennis Court at St. James's, Westminster, presenting adaptations of Shakespeare as well as plays by herself, her father Colley Cibber, and her friend Henry Fielding. Fielding eventually ran his own puppet theatre under the pseudonym Madame de la Nash to avoid the censorship concomitant with the Theatre Licensing Act of 1737. Punch was extremely popular in Paris and, by the end of the 18th century, he was also playing in Britain's American colonies, where even George Washington bought tickets for a show. However, marionette productions were expensive and cumbersome to mount and transport, presented in empty halls, the back rooms of taverns, or within large tents at England's yearly agricultural events at Bartholomew Fair and Mayfair. In the latter half of the 18th century, marionette companies began to give way to glove-puppet shows, performed from within a narrow, lightweight booth by one puppeteer, usually with an assistant, or "bottler," to gather a crowd and collect money. These shows might travel through country towns or move from corner to corner along busy London streets, giving many performances in a single day. The character of Punch adapted to the new format, going from a stringed comedian who might say outrageous things to a more aggressive glove-puppet who could do outrageous—and often violent—things to the other characters. About this time, Punch's wife's name changed from "Joan" to "Judy." ^ a b Wheeler, R. Mortimer (1911). "Punch (puppet)". In Chisholm, Hugh. Encyclopædia Britannica. 22 (11th ed.). Cambridge University Press. pp. 648–649. ^ Seccombe, Thomas (1896). "Powell, Martin". In Lee, Sidney. Dictionary of National Biography. 46. London: Smith, Elder & Co.
Pepys saw this "Italian puppet play" again at a stage in Whitehall Palace at a performance before the King. In October 1660 a small stage was constructed in the Queen's Guard Chamber at Whitehall, probably for this performance by puppets; as a reward for the performance, Signor Bologna alias Policinella was presented with a gold chain and medal. (E. Boswell, Restoration court stage, pp. 56-7, 116).